Ardian Infrastructure reported that it sold its 49% stake in London Luton Airport (LLA) to AMP Capital, the Australian specialist global investment manager. Ardian acquired its stake in the airport in 2013 and in conjunction with airport operator Aena , invested over £160 million (US$222m) in the airport’s development. The result has seen passenger numbers increase from 9.7 million in 2013 to 15.8 million in 2017, thus making LLA one of the UK’s fastest-growing airports. The airport’s route network has substantially increased since Ardian and Aena joined forces. Today it serves more than 140 destinations across Europe, Asia and Africa. In addition, the airport has also seen the creation of 3,000 jobs, either directly or indirectly. The Boeing Company has reported first-quarter revenue of US$23.4bn reflecting higher commercial deliveries and mix, defense contract volume and services growth. GAAP earnings per share increased to US$4.15 and core earnings per share (non-GAAP) increased to US$3.64 reflecting strong performance across the company. Commercial Airplanes first-quarter revenue was US$13.7bn reflecting higher deliveries and mix. First-quarter operating margin increased to 11.0%, reflecting strong operating performance on production programs. During the quarter, Commercial Airplanes delivered 184 airplanes, including delivery of the first 787-10 Dreamliner to Singapore Airlines and delivery of the first 737 MAX 9 to Lion Air Group. 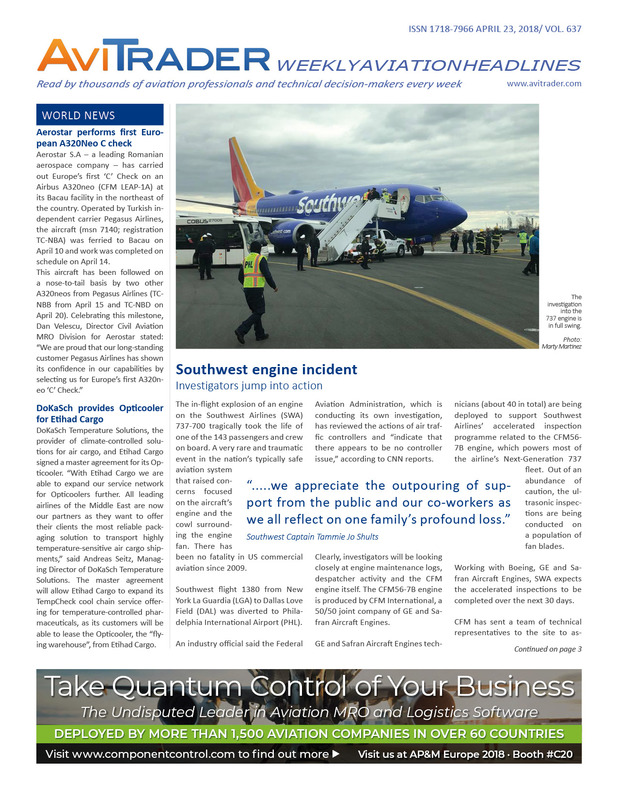 The 737 program reached additional milestones during the quarter, including first flight of the 737 MAX 7 and firm configuration of the 737 MAX 10. The 737 program has captured over 4,400 orders since launch for the 737 MAX, including a recent order from Jet Airways for 75 additional airplanes. Reflecting the strength of the cargo market, Boeing now plans to increase the production rate on the 767 program from 2.5 to 3 per month beginning in 2020. Development on the 777X program remains on track as production began on the first 777X fuselage for structural testing. Axel Flaig is new Chairman of the four-member Advisory Board of Bauhaus Luftfahrt. 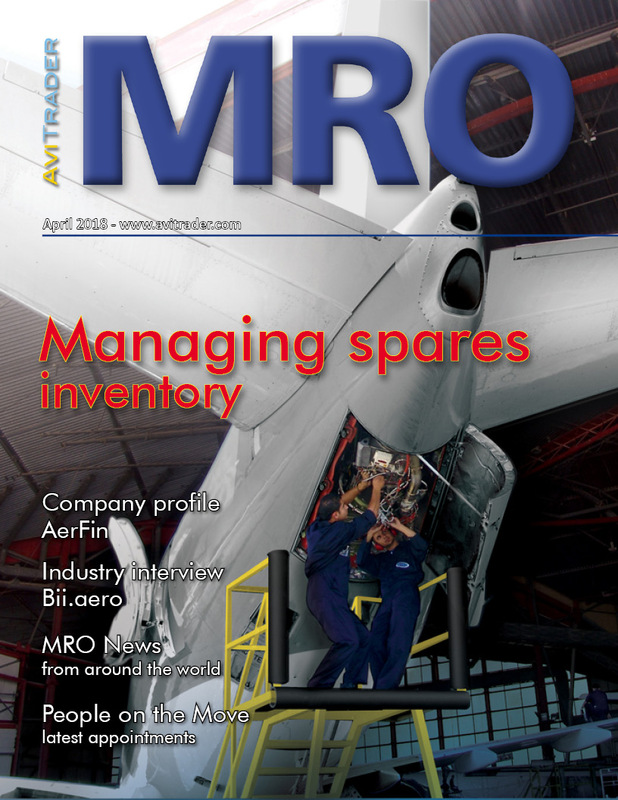 The Airbus manager succeeds Dr. Rainer Martens (MTU Aero Engines), who has held the position since May 2014. Martens ended his active career as Chief Operating Officer of MTU Aero Engines and consequently resigned from his position on the Supervisory Board of Bauhaus Luftfahrt. MTU Aero Engines is now represented by Lars Wagner. For Liebherr-Aerospace Lindenberg, Josef Gropper will return to the Advisory Board, who was already a member of the Board from September 2008 to November 2011. The representation of IABG Industrieanlagen-Betriebsgesellschaft by Prof. Dr. Rudolf F. Schwarz remains unchanged. GE Aviation's GEnx-1B engines will power Turkish Airlines' 25 Boeing 787 Dreamliners and five options, which were ordered last month. The airline also signed a 15-year TrueChoice™ Flight Hour agreement with GE for maintenance, repair and overhaul for the GEnx-1B engines ordered. GE Aviation hosted the U.S. Army for the successful Preliminary Design Review (PDR) of the T901-GE-900 engine in early March. The T901 is GE Aviation's engine for the Improved Turbine Engine Program (ITEP), the U.S. Army's undertaking to re-engine its Boeing AH-64 Apaches and Sikorsky UH-60 Black Hawks. The PDR is a major milestone within the Technology Maturation and Risk Reduction (TMRR) contract, a $102 million, 24-month contract the Army awarded GE in September 2016. The Army is in the process of down selecting to one engine manufacturer for the Engineering and Manufacturing Development (EMD) phase by the end of 2018. The U.S. Army Contracting Command (ACC), based at Redstone Arsenal in Huntsville, Ala., released its request for proposals for the EMD last November. GE Aviation submitted the first phase of the proposal in February and is currently preparing the second and final phase of its proposal based on the engine configuration reviewed at the PDR. GE Aviation successfully completed a fit test with the Army this past December using a full-scale engine mockup. It demonstrated that the T901 engine seamlessly integrates with the Apache and Black Hawk airframes. GE's experience in powering these aircraft missions with the T700 engine over the past four decades has informed its development of the T901; it positions the Army and GE to make a smooth transition from the T700 to the T901. GE has invested more than US$9bn in maturing commercial technologies applicable to the T901 and more than US$300m to develop and test turboshaft-specific technologies ahead of the PDR. GE funded and successfully completed testing a T901 prototype engine, as well as component tests. These company-funded investments demonstrate GE's commitment to providing only the most advanced technologies available to the Warfighter and the Department of Defense. Air BP, the international aviation fuel products and service supplier, has strengthened its presence in Brazil and will start supplying fuel at Santos Dumont airport (SDU/SBRJ). Santos Dumont complements Air BP’s existing operations in Rio de Janeiro which include Galeão International airport (GIG/SBGL), Jacarepaguá (JCR/SBJR), Cabo Frio (CFB/SBCB) e Macaé (MEA/SBME). This is an important addition to Air BP’s network and comes in response to increased demand from the general and commercial aviation sectors. The Dubai Aerospace Enterprise (DAE) engineering division Joramco, has added Boeing 787 C check to its existing capabilities. This addition has been approved by the Jordanian Civil Aviation Authority (JCARC) and the Federal Aviation Administration (FAA). For the first time in ten years Finnair has achieved a profitable comparable operating result in the first quarter. Revenue for the first quarter increased by 14.6% to €635.3m, compared to €554.4 in the first quarter 2017. Available seat kilometres (ASK) grew by 18.9% and passenger load factor (PLF) increased by 1.5 points to 82.9%. Comparable operating result was €3.9m compared to €-9.0m in 2017. Operating result was €6.0m, compared to €-10.0m in the first quarter 2017. Net cash flow from operating activities was €78.0m, compared to €23.9m in 2017 and net cash flow from investing activities was €-53.9m, compared to €145.1 the previous year. Unit revenue (RASK) decreased by 3.6%. Unit revenue at constant currency decreased by 1.7%. Unit cost (CASK) decreased by 5.8%, and unit cost at constant currency excluding fuel decreased by 4.5%. Sabre Corporation has announced a renewed content distribution agreement with Hainan Airlines, reiterating Sabre’s added value as the airline fast-forwards growth and scales global operations. Hainan Airlines has been a long-term strategic partner with Sabre, first adopting its innovative airline solutions over a decade ago with access to a broad, state-of-the-art suite of planning and scheduling technology to support its operations. “We are pleased to continue this wide-ranging partnership with Hainan Airlines, who has made our innovative solutions, network and expertise an integral component of their business development plan. Sabre is well-positioned to support Hainan Airline’s fast-growing operations in one of the world’s most rapidly changing markets,” said Rakesh Narayanan, vice president air line of business, Sabre Travel Network Asia Pacific.